Mamma Mia! Here We Go Again (film, 2018). 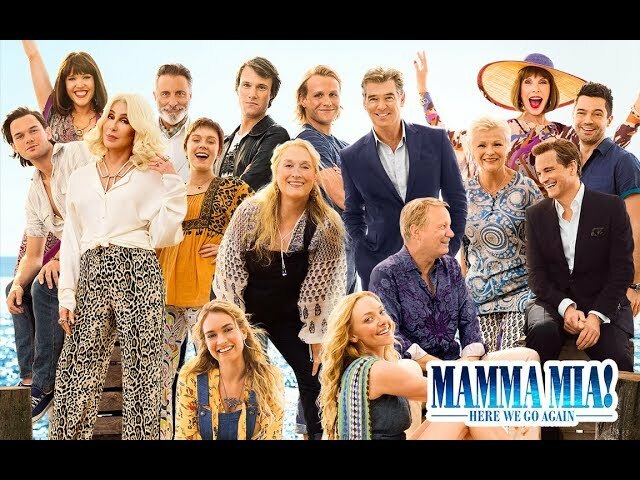 A 2018 jukebox musical romantic comedy film with "PG-13" rating by Universal Pictures. Directed by Ol Parker. Official Trailer. Mamma Mia! Here We Go Again is a 2018 jukebox musical romantic comedy film directed by Ol Parker. Mamma Mia! Here We Go Again - Final Trailer. Sophie Sheridan is preparing for the grand reopening of her mother Donna's hotel, following Donna's death a year earlier ("Thank You for the Music"). She is upset because two of her fathers, Harry and Bill, are unable to make it to the reopening and she is having trouble in her relationship with Sky, who is in New York, over her memorializing her mother's life ("One of Us"). In 1979, a young Donna graduates from Oxford's New College with Rosie and Tanya ("When I Kissed the Teacher"), and prepares to travel the world. In Paris, she meets and parties with Harry. They spend the night together ("Waterloo"), but Donna leaves soon after. She misses her boat to Kalokairi but is offered a ride by Bill, and along the way, they are able to help a stranded fisherman, Alexio, back to shore in time to stop the love of his life from marrying another. Unbeknownst to Donna, Harry has followed her to Greece; but he arrived too late, and sadly watches the boat sailing off in the distance ("Why Did it Have to Be Me?"). In the present, Tanya and Rosie arrive to support Sophie with the reopening and it's revealed that Rosie and Bill have split up. Sophie then visits Sam, who is still grieving over the death of Donna. Back in the past, Donna arrives on the island ("I Have a Dream") and while exploring the farmhouse, a sudden storm causes her to discover a spooked horse in the basement. She finds a young Sam riding his motorcycle and he helps her to save the horse. Back in the present, a storm has caused serious disruption to Sophie's plans for the grand reopening and prevented media coverage of the event. the pianist in the Parisian restaurant during "Waterloo"
Principal photography began on August 12, 2017 in Croatia, including the island of Vis. 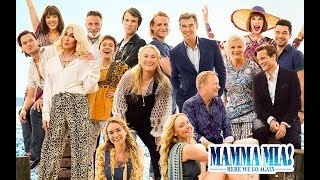 The film Mamma Mia! 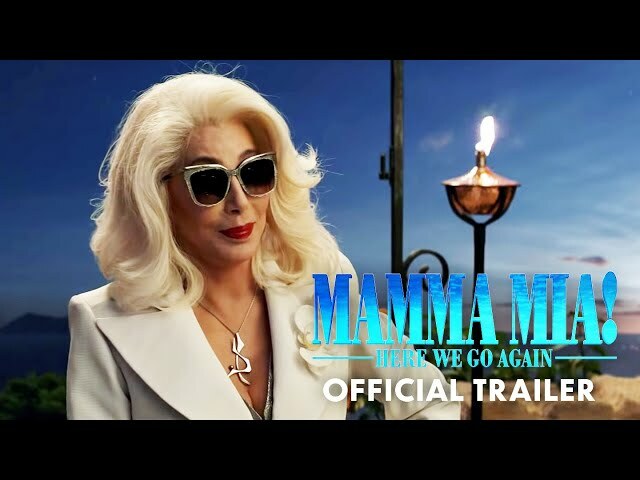 Here We Go Again was scheduled to be released by Universal Pictures on July 16, 2018 (Hammersmith Apollo), on July 18, 2018 (Belgium, Sweden), on July 19, 2018 (Germany), on July 20, 2018 (United Kingdom & United States, United States, United Kingdom, Canada), on July 25, 2018 (France) and on August 9, 2018 (Ukraine). The duration of the film is 114 minutes. With a budget of $75 million, the film grossed over $394.7 million. Mamma Mia! Here We Go Again got high rating from critics. The audience also likes the film. Audiences polled by CinemaScore gave the film an average grade of "A-" on a scale ranging from A+ to F.